It's Thursday and over on the Art Impressions Blog we have another challenge. Today it is Seeing Spots! Well...I was going to skip this one due to being behind, but all of a sudden at 10:30 pm before it was due an idea popped into my brain. I ran upstairs and this is what I came up with. I used one of the Art Impressions Girlfriend stamps and cut away just one of the girls to use. The sentiment is a from the Girlfriends line. The diecut letters are Cricut. 45 minutes later = DONE! I'm glad I didn't skip it. LOL...........This is too cute!! !Love it! 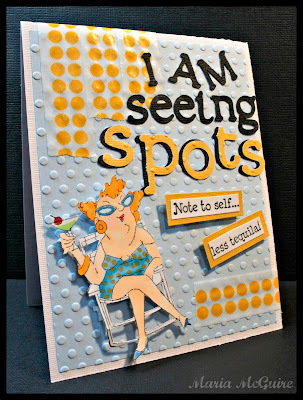 This is a great card....love the Washi tape and all the dots....perfect with your image!! oh my goodness - absolutely LOVE this!